With such limited space on river cruise vessels, river cruise lines have to get creative in order to evolve and differentiate their cabin designs. But this season, there will be no shortage of innovative stateroom concepts as river cruise operators roll out everything from tricked out lower-deck cabins to stunning suites. River cruise lines often put a great deal of emphasis on their upper-deck staterooms, a showcase of competing balcony concepts, creative cabin layouts and sprawling suites. But one area of the river cruise ship that often gets neglected is the lower deck. Because the lower deck dips partially below water level, the cabins on this level can usually only accommodate smaller windows that do not open. But with its two new Inspiration Class ships, the 130-passenger Inspire and Savor (launching in April and June, respectively), Tauck has addressed the oft-overlooked lower-deck cabins with a new lofted lower-cabin design. On both ships, eight of the lower-deck cabins will feature a raised platform seating area with a small table and two chairs and a raised ceiling that will accommodate a much taller window, the upper portion of which can be opened for fresh air. The Category 3 cabins will be 225 square feet each, and the larger windows will measure 8 feet by 9.5 feet. 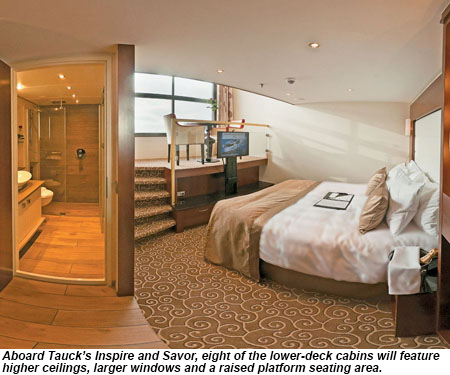 According to Tauck, suites are often the first class of cabins to sell, and other river cruise lines have confirmed a similar selling pattern on their vessels. But the lower-deck cabins are just as critical to filling the ships and achieving strong load factors. While they might not be as alluring as the more spacious suites or as upper-deck cabins that usually feature full or French balconies, they usually represent the lowest-priced cabins and thus open up river cruising to passengers who might be more budget-oriented, are traveling alone or are traveling with family. The loft design is the strongest (if not the only) attempt to date at making these lower-deck cabins considerably more enticing and pleasant than they have traditionally been in the past. Both ships will be 443 feet long with 22 suites at 300 square feet each, complete with two French balconies with floor-to-ceiling windows, a pullout couch, walk-in closest and bathroom with rainfall showerhead. There will also be 32 cabins at 225 square foot each and an additional 13 cabins ranging from 150 to 190 square feet. Four of the 150-square-foot cabins are being set aside for solo travelers. And while Tauck has made a big push to overhaul lower-level cabin design, developments are continuing throughout the upper-level staterooms on this year’s forthcoming newbuilds. Uniworld Boutique River Cruise Collection’s 159-passenger S.S. Catherine, which is being christened this week in the South of France, features a 410-square-foot Royal Suite that joins the ranks of the Viking Longships’ 445-square-foot Explorer Suites as being among the few river cruise suites in Europe that top the 400-square-foot mark. If preview photos of the S.S. Catherine are any indication, the Royal Suite (along with all of the vessel’s cabins, for that matter) promises to be not only spacious but a feast for the senses, featuring Uniworld’s trademark boutique hotel interiors that are designed by sister company Red Carnation Hotels. Think bold textiles, textured wallpaper and details galore. Emerald Waterways, the river cruise line being launched by Australian parent Scenic Tours as a four-star alternative to the company’s existing river cruise line, Scenic Cruises, will officially come to life next month when its two debut vessels, the 182-passenger Emerald Star and Emerald Sky, set sail. 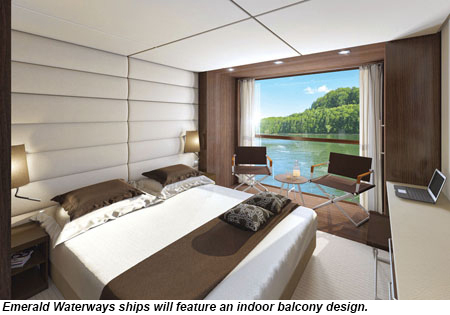 The vessels’ 180-square-foot Panorama Balcony Suite concept will feature an indoor balcony design, similar to a concept introduced by Uniworld several years ago, which involves a retractable window that with the touch of a button enables passengers to convert the room into an open-air balcony. The idea is to maximize limited cabin square footage. Lastly, while it isn’t launching in 2014, Haimark Ltd.’s 24-passenger Mekong Princess, slated to deploy in Vietnam and Cambodia in September 2015, is worth mentioning for its all-suite spa concept that will place an emphasis on luxury spa treatments, services and details throughout the vessel. Early renderings of the suites indicate over-the-top Indochina glamour coupled with relaxing spa amenities. Carnival Cruise Lines and Costa Cruises are doing better, according to Carnival Corp.’s first-quarter financial report this week (see bottom of this report), but the company’s largest brands in the U.S. and Europe still have a steep hill to climb. How steep? CFO David Bernstein said that based on the guidance of Carnival Corp.’s competitors, those companies are at or near 2008 levels for net revenue yield, a key cruise industry metric similar to revenue per available room (RevPAR) in the hotel industry. Conversely, Carnival Corp.’s yield is down about 11% from 2008, Bernstein said. Delving further, Bernstein said the company took a 10% hit from the global financial crisis of 2009, gained about half of that back by 2011, but lost those gains after the Costa Concordia accident in 2012 and the much-publicized stranding of the Carnival Triumph in 2013. 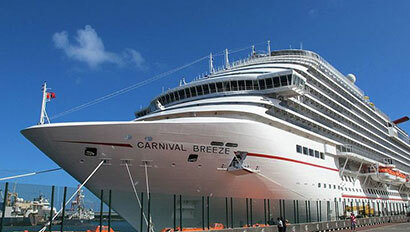 There were good signs from Costa and Carnival in Carnival Corp.’s first quarter, the three months ended on Feb. 28. Costa’s yield was up, Carnival Corp. CEO Arnold Donald said, aided by a 50% increase in booking volume. However, Costa’s gain was more than offset by a yield decrease for the company’s other European brands, which struggled largely due to a stagnant economy in Europe. 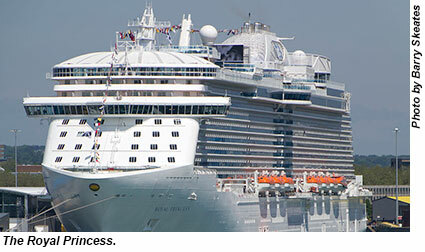 Carnival Corp. said that net ticket yield fell 3% for all European cruise lines. Carnival, too, had strong booking volume. Donald referenced the brand’s single-month record for bookings in January, when 565,000 people reserved space on a Carnival cruise. Attractive promotions and increased advertising spending helped make that happen. Donald said the company will spend $600 million on advertising in 2014, a 20% increase over 2012. He said Carnival’s TV ads during the Sochi Winter Olympics and Princess’ first TV ad campaign in 10 years were vehicles to attract first-time cruisers. But because of discounting, particularly in the Caribbean where most of Carnival Cruise Lines’ ships operate, Carnival Corp.’s yield fell 2.1% in Q1. The company forecasts that yield will fall 3% to 4% in Q2, compared with a year earlier. The improved performance of Carnival and Costa “builds confidence that we are tracking to turn the corner beginning in the second half of 2014,” Donald said. But until that corner is turned, discounting will continue. Donald said that increased capacity in the Caribbean industrywide puts pressure on pricing. The company is “behind on both price and occupancy” in the Caribbean, Bernstein said, despite the Carnival brand’s record-breaking January. The North America brands are best performing in Europe for their seasonal program, where they are “well ahead on price and occupancy,” Bernstein said. Carnival Corp. said Tuesday that the company had a $15 million net loss for its fiscal first quarter, the three months ended Feb. 28. The results beat the company’s December guidance, thanks to ticket prices that were better than expected. The loss compares with a $37 million net profit in the previous year’s first quarter. Revenue was essentially flat at $3.59 billion. Carnival Corp.’s net revenue yield, a key metric for cruise companies that measures revenue generated per unit of available accommodations, fell 2.1%. At the same time, operating expenses rose 1.9%, to $3.51 billion, driven by increased spending on advertising. Fuel prices declined 3.4%, to $654 per metric ton. CEO Arnold Donald said first-quarter results exceeded the company’s December guidance because ticket prices were higher than expected for Carnival Cruise Lines and the company’s European cruise brands, and due to the timing of certain expenses. Looking ahead to the second quarter, Carnival Corp. expects that net revenue yield will fall 3% to 4% compared with the prior year. The company also anticipates an increase in net cruise costs per available lower berth day (excluding fuel) of up to 3.5% because of higher selling and administrative costs. Royal Caribbean International is eliminating the main dining rooms on its two upcoming ships, the Quantum and Anthem of the Seas, in favor of five smaller restaurants that will offer specific culinary styles. Royal Caribbean also introduced four new specialty restaurants. Patrons will pay a cover to dine at these restaurants. 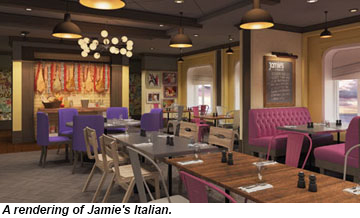 The specialty restaurants include Jamie’s Italian, which was developed in co ncert with celebrity chef Jamie Oliver. 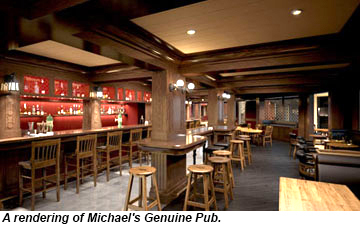 Michael’s Genuine Pub will be a gastropub built on a relationship with chef Michael Schwartz. Devinly Decadence, designed by bestselling author and chef of NBC’s “The Biggest Loser” Devin Alexander, will feature a low-calorie menu. 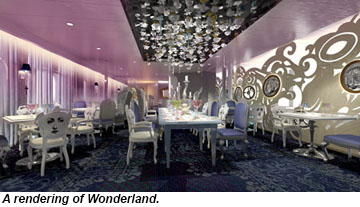 Also carrying an extra charge will be Wonderland, where chefs will “twist their culinary kaleidoscopes to invent a dreamscape of never-before-seen fare,” Royal Caribbean said. In addition, the ships will carry Royal Caribbean stalwarts Chops Grille, Izumi Japanese Cuisine and Chef’s Table, plus casual eateries such as the Windjammer lido cafe, Sorrento’s and Johnny Rockets. Also on the casual side, the SeaPlex Dog House will be the first food truck at sea, Royal Caribbean said. The line will use a new reservations system for the restaurants. In eliminating the main dining room, Royal Caribbean appears to be taking the next step in the evolution of cruise ship dining. Norwegian Cruise Line’s most recent ships, the Breakaway and the Getaway, each have three main dining rooms, but they are smaller and quieter than the traditional two-deck dining rooms on cruise ships. One of main dining rooms on the Breakaway and Getaway has a different menu than the other two. Princess also has experimented with smaller main dining rooms and cuisine-specific restaurants that are included in the cruise fare. Still others have been working on new concepts within their traditional dining rooms, such as Carnival Cruise Lines with its American Table and American Feast. The 4,180-passenger Quantum of the Seas, scheduled to enter service this November, will sail from Cape Liberty Cruise Port in Bayonne, N.J. The Anthem is due to enter service the following spring.